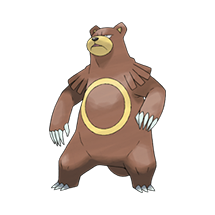 Let's face it: Ursaring will never be THAT great of a Pokemon. If, at all, it will forever go down as a gimmicky Pokemon that has the chance at a Belly Drum / Quick Feet Combination. However, that's not to say that ursaring can't cause a little destruction every now and then, especially it's given the chance to set up nicely. Summary: This has got to be one of my favorite movesets to use on Ursaring, even though it is completely a gimmick. Start by coming in on a Pokemon that is on the slower side and won't do damage to it, allowing you to get off a Belly Drum. After the first turn, if all goes according to plan, Ursaring will have an Attack Stat of over 1400 and Speed Stat of 358 because of Quick Feet. From there, you can do your best to try to sweep the opposing team. Crunch gives you coverage against Ghost Types, as Close Combat does the same for Ground and Rock Types. Facade is where the real power is at, having a Base Power of 210 due to STAB. Countering: One Prankster User with the move Taunt can easy destroy this entire spread for Ursaring. No Belly Drum, and it's pretty much done for. Quicker Pokemon, especially those with 360 Base Speed also can finish it off pretty quick even if it gets off Belly Drum.